Emory Ellis is suing Burger King, accusing the chain in a lawsuit filed this week of discriminating against him because he’s black and homeless. Emory Ellis was just trying to buy breakfast. 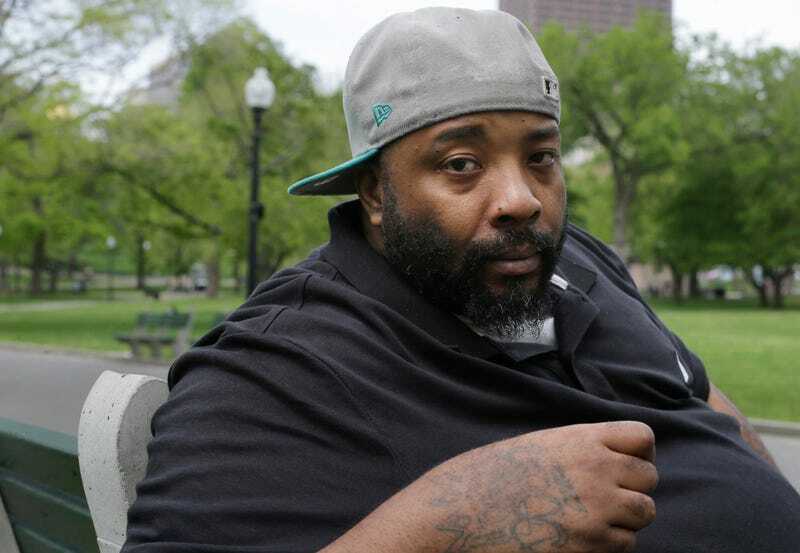 At a Boston Burger King in November 2015, Ellis, who was homeless, attempted to pay for his morning meal with a $10 bill—a simple transaction that goes without incident or comment millions of times each day across America. But on this morning the cashier accused Ellis, who is black, of paying with fake money. Instead of handing Ellis his meal, the Burger King employee called the cops, who arrested the then-homeless man and hauled him off to jail. Ellis would spend more than three months behind bars before an investigation concluded that the $10 bill had been real all along. Now Ellis has filed a suit against the fast-food company for nearly $1 million, alleging that he was discriminated against because of his appearance, the Associated Press reports. He’s suing both the franchise and the employee who wrongfully accused him of using forged money. Ellis’ attorney, Justin Dreschler, told AP that it was unlikely a white man in a suit would have been accused of paying with counterfeit money—particularly with such a low denomination. And even if the cashier suspected that the money was fake, he could easily have chosen not to accept the cash instead of calling the police, Dreschler added. Because the wrongful arrest violated Ellis’ probation, he was denied bail. He spent more than three months in jail—the amount of time it took the Secret Service to determine that the $10 bill he attempted to use was real. Ellis was finally released in February 2016 after prosecutors dropped the forgery charge against him. For all the trouble Ellis went through trying to get a meal, he never even got his money back, the lawsuit indicates. The suit comes amid increased national scrutiny on the ways in which black people are routinely harassed by nonblack people for the most innocuous actions, whether it be waiting for a friend in Starbucks, taking a nap in a common room or cooking out in a park. In many of these cases, the police are called, increasing the risk of a wrongful arrest or a fatal escalation. In the case of two black men arrested at a Philadelphia Starbucks in April, the city of Philadelphia settled for $1 each, along with pledging to start a program for young entrepreneurs. The city also wiped the arrest from the men’s records. The men settled with Starbucks for an undisclosed amount. The 37-year-old Ellis, who filed his lawsuit in Suffolk County Superior Court in Massachusetts on Wednesday, is seeking $950,000 in damages.